(Chicago, Illinois) - A landmark on Chicago’s famed “Magnificent Mile” the Westin Michigan Avenue is rich in history and contemporary luxury. Originally scheduled to open its doors as the Continental Plaza on November 22, 1963; it was delayed until the following day due to the assassination of the United States 35th President - John F. Kennedy. Since its opening the hotel has long been a popular retreat for celebrities, athletes and dignitaries from around the world. 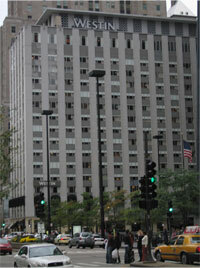 In fact, the Westin Michigan Avenue is the “official hotel” for out-of-town MLB teams. A founding member of Michigan Avenue’s architectural elite, the Westin Michigan Avenue serves as the benchmark in the luxury hospitality industry. Standing 27 stories high and offering 751 contemporary guestrooms, 23 suites, and 37,000 sq ft of award winning meeting space; the hotel is ideal for prominent gatherings, business meetings, dinner dances and weddings. To keep with their long standing promise of a “transformative hotel experience” and to “leave you feeling better than when you arrived”, the Westin has had to ensure the upmost comfort throughout every room of the hotel. To help deliver this required comfort the hotel contracts with Anchor Mechanical, an experienced Chicagoland HVAC/Plumbing contractor, and local KMC Controls authorized partner, to provide and install KMC products. Building management understood that being able to precisely control their HVAC system would help create the comfortable and healthy environment that building occupants came to expect. For their original installation in 1994 the hotel elected a KMC proprietary system. 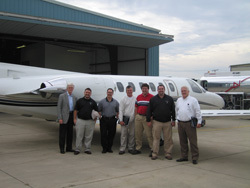 The project consisted of a sub-net LAN of approximately 30 KMD-5501 and KMD-5502 controllers; controlling everything from the air handling units, to chiller and boiler plants, to the exhaust fans and other central system components. Over the next 14 years the system worked flawlessly. “Ever since our first installation we have never had a problem with our KMC system,” explained the hotel’s Director of Operations, Bob Thomas. 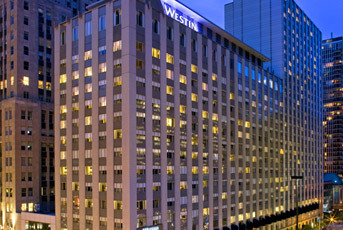 To further showcase their desire to remain in touch with new trends and their customers, the Westin Michigan Avenue decided to move forward with an aggressive renovation plan in the spring of 2008. “Management wanted to build on their culture of sustainability and to make their hotel more comfortable, environmentally friendly, and energy efficient,” commented Anchor Mechanical’s Service Technician, Steve Rosner. Since the renovations, the Westin Michigan Avenue Chicago has received both a Bronze (GS-33) Certification by The Green Seal Environmental Standard for Lodging Properties as well as a Green Energy Certification by the IHLA Stay Green (Illinois Hotel Lodging Association).